I love dips because they are simple to make, and can be served at about any event. Like Deviled Eggs Dip, Creamy Chicken Caesar Dip and Roasted Red Pepper Tomato Feta Dip, this dip will be the highlight of any party! Million Dollar Dip is basically a bowl full of happiness! You can’t go wrong with so many layers of pure cheesy goodness! 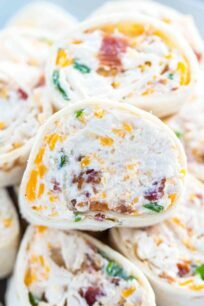 A delicious blend of cream cheese, Gruyere cheese and blue cheese dressing combined with layers of aged sharp cheddar cheese, lots and lots of bacon, slivered almonds and green onions. 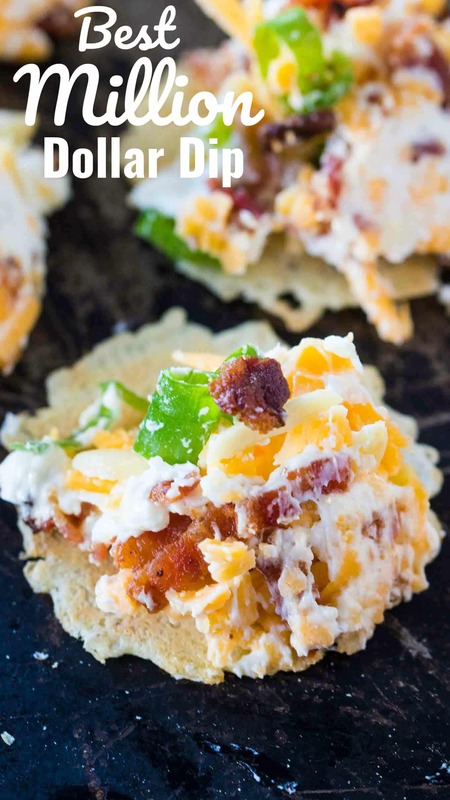 This dip is a great appetizer you can serve at just about any event. Serve with chips, crackers or crunchy veggies, this Dip will be gone before you know it. You need a softer, creamy base, that will basically pull the dip together. I used a mix of cream cheese, blue cheese dressing and Gruyere cheese. If you are not a fan of the blue cheese dressing, feel free to use Ranch or Buttermilk salad dressing. 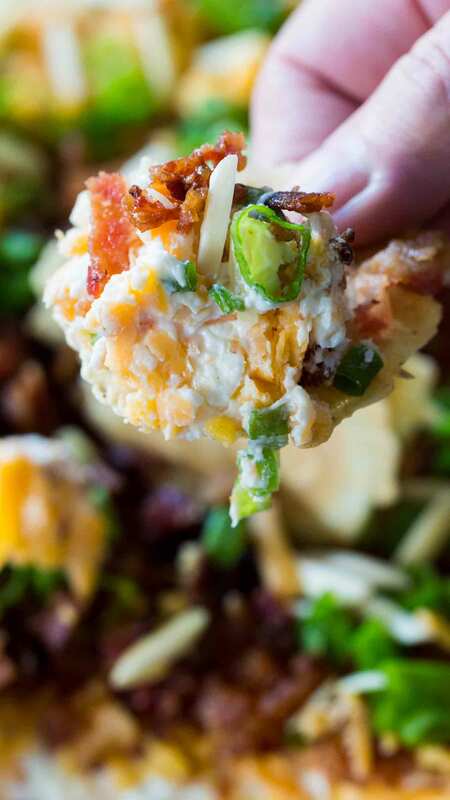 The bacon is optional, you can skip it if you want to make a vegetarian version of this dip. Select a good cheddar cheese, preferably aged, so it ads flavor to the dip. Don’t buy the shredded/grated cheddar cheese, get your hands on a quality cheddar cheese and grate it at home. The difference in flavor is huge. 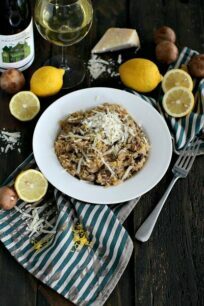 The slivered almonds are added for texture, also they pair nicely with the cheese. You can use chopped pecans or chopped walnuts instead. 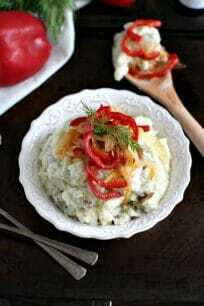 The green onion add freshness to the overall hearty and savory dip, but you can skip them if you are not an onion fan. What to serve with Million Dollar Dip? Can you refrigerate Million Dollar Dip? Yes. If you plan on refrigerating the dip, wrap the dish tightly in plastic wrap, this way the cheese won’t dry out. Cook the bacon, let it cool and crumble. You can also use store bought, pre-cooked bacon. In a large bowl, whisk together cream cheese, blue cheese dressing, minced garlic and Gruyere cheese until fully combined. 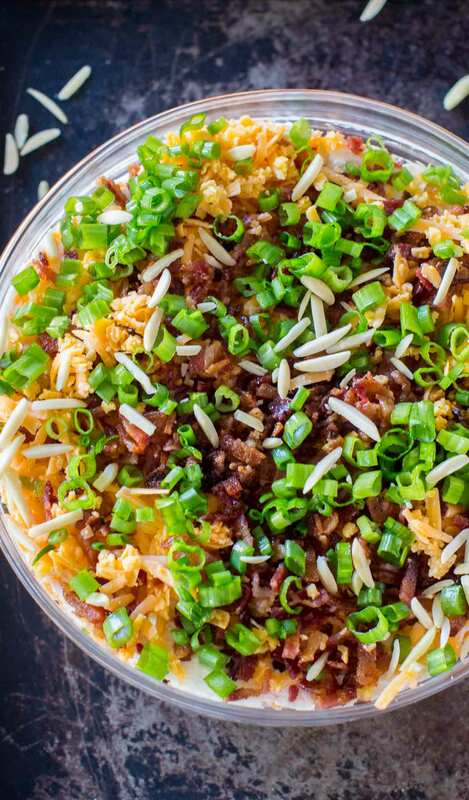 In a deep, large glass salad bowl, start layering the dip: 1/3 cream cheese mixture, sprinkle 1/3 silvered almonds, followed by 1/3 of the grated cheddar cheese, 1/3 of the bacon and 1/3 of the green onions. Serve immediately with crackers or wrap tightly with plastic wrap and refrigerate until ready to serve. It is best to consume the dip in 1-2 days, after that the texture will change. Also, the bacon hardens the more you keep it in the fridge. This would be a hit at my football party this weekend. WOW!!! This dip is absolutely amazing!! Can’t wait to try it! This is a truly loaded dip!! Looks fantastic! That’s one dip that I would be coming back for seconds and thirds! I bet this dip is a huge hit at parties! 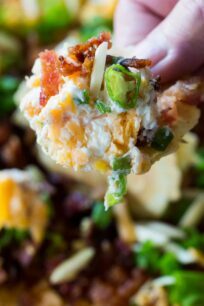 Always looking for new and delish dips to take to parties. This is a winner! What a delicious party dip! Looks amazing! So happy to have come across this variation! I found and tried another that did not use cream cheese and recommended that I refrigerate two hours before serving. I was unhappy with the dryness of it as well as the consistency, it was good but not cracker friendly. Thank you and I look forward to trying! Do you thi k this could be turned I to a cheese ball esp. if there are leftovers? Yes, you can turn the leftovers into a cheese ball, if its too soft just add more shredded cheese to roll it. What size packs of cream cheese do you mean? 8 ounces each, sorry for the confusion. Could you serve this hot? What do you mean? Melted?